What is the most personal element that you can add to any scrapbook layout? Isn't it all of our wonderful moments and memories caught on film that got us wrapped up in this wonderful hobby of scrapbooking, after all? Well, I don't know one scrapbooker that doesn't strive to make the most of their photos and Ella Publishing has a great new eBook available to offer you all the tips and tricks you need to really make your photos shine called Don't Say Cheese! written by family and children's photographer Rebecca Cooper. In Ella's longest eBook to date, Rebecca Cooper is back with a new photography guide that's all about taking photos of kids. This 52-page downloadable eBook is packed with 247 tips, tricks, and ideas to help you capture your children's real smiles and authentic expressions—images that show who they really are (and go far beyond asking a child to just "say cheese"). Drawing on Rebecca's years of professional experience with little kids' photography, this eBook is divided into sections specifically for children, toddlers, babies, and newborns. With all this, plus the bonus Photo Games and Checklists section, you'll be capturing real smiles in no time at all—and having a great time with your kids along the way. 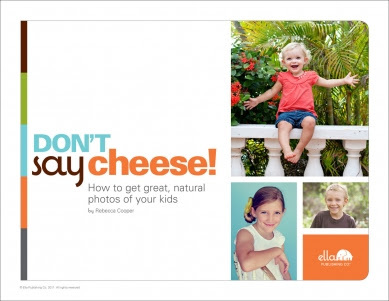 Save the cheese for your pizza and try Rebecca's tips for photographing children instead! 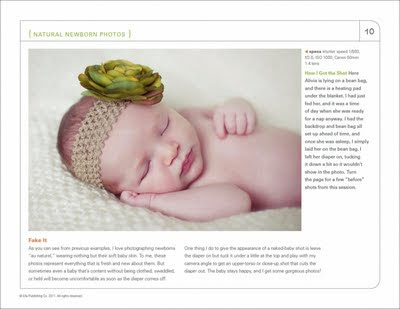 There are five sections: Natural Newborn Photos, Beautiful Baby Photos, Terrific Toddler Photos, Authentic Kid Photos and Photo Games & Checklists. 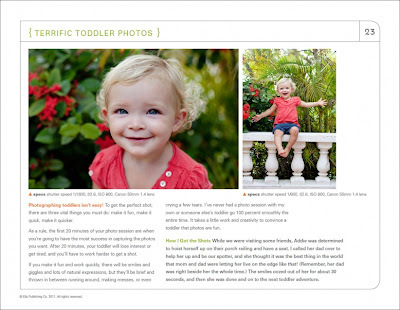 Each section starts out with an amazing list of tips and tricks and is followed by an array of amazing sample photos. Each sample photo include a "How I Got the Shot" commentary from the author and specific camera specs. At the end, there are four checklists of 25 shots to take of your kids...one for each season! I have a free copy of Don't Say Cheese! to give away to one lucky reader. Simply leave a comment answering the following question by 5 p.m. (CST) on Thursday, September 8, 2011 and you'll be entered for a chance to win. Do you have difficulty getting natural expressions out of your photo subjects? Do you have any tried and true technique for getting a 'keeper'?